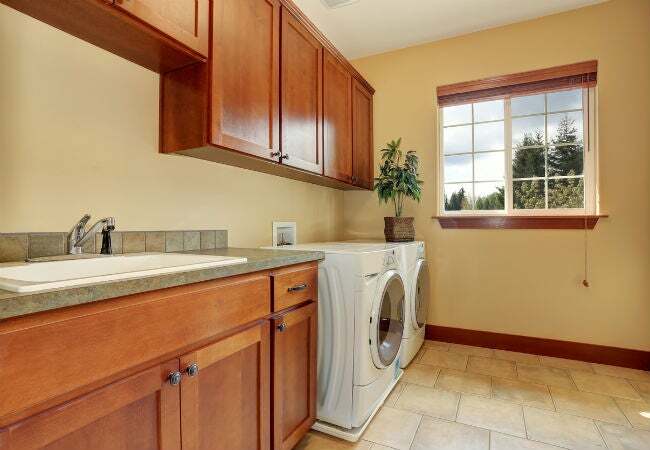 Use this guide to zero in on the best—and worst—flooring options for your laundry room. 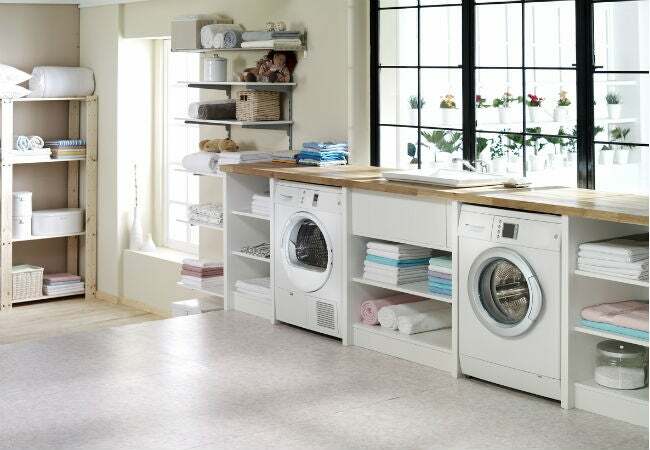 Replacing torn, worn, or outmoded flooring is a surefire way to lend a fresh look to your laundry room. But this particular space has traditionally been challenging to outfit since it’s vulnerable to damage from so many sources: stains from spilled or splattered bleach, warping or mold growth from appliance leaks, and dents from swapping out one or both of the heavy appliances. And, if your laundry room is located in the mudroom, your flooring faces additional threats like sopping umbrellas and mud tracked in from the outdoors. 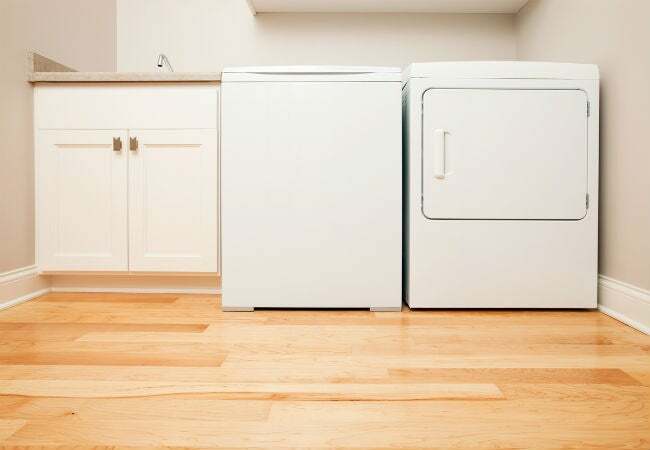 Ahead, we assess the pros and cons of five popular options for laundry room flooring and rule out three that aren’t worth the cost or trouble. As you might guess from the name, LVT is more expensive than sheet vinyl; it ranges from $2 to $7 per square foot in materials, according to cost guides on ImproveNet, a home improvement planning website. But, some consumers will say it’s worth the extra money: LVT is thicker and thus quieter, more insulating, and softer. It’s also a step up in the looks department as the printed layer can be made to look like higher-end materials, namely hardwood or stone. You can install the tiles directly over existing flooring, and their small size—usually 12 inches by 12 inches—makes them easier to replace than sheet vinyl. Just watch out for irregularities or unevenness in the substrate, which may show through the flooring and cause gaps or lifts around edges. The most budget-friendly vinyl option, at $0.50 to $3.50 per square foot, according to ImproveNet, sheet vinyl can appear as a solid color or a printed design. This type of flooring is glued down to the laundry room subfloor in large, 6′- to 13′-wide sections, which makes for fewer seams than LVT flooring but also a more difficult do-it-yourself installation. Also, when damaged, entire sheets must be replaced at a time. Like LVT, sheet vinyl is waterproof and stain- and scratch-resistant, and, as a grout-free floor type, it needs only dry sweeping or wet mopping. However, it’s thinner than LVT, and therefore offers less insulation against the cold and sound and is more prone to denting or tearing from fallen objects or appliance moves. It lasts only five to 20 years or more. 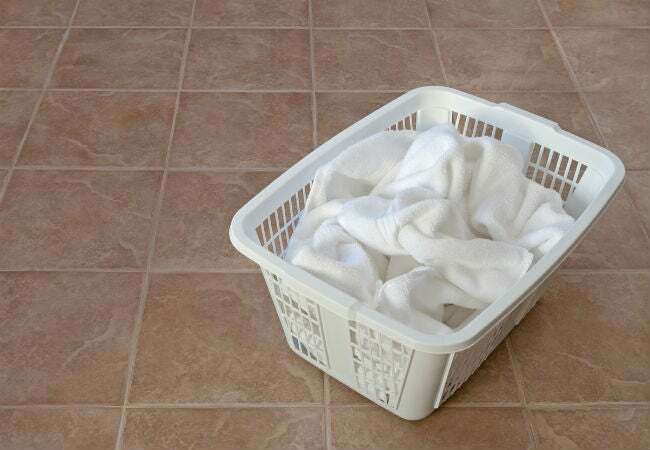 Anywhere from $0.85 to $2.50 per square foot, according to ImproveNet, ceramic tile boasts the best starting price of any laundry room flooring. You can find it sold glazed or unglazed, individual blocks of varying shapes and sizes or in pre-laid mosaic tile sheets that forgo the need for individual tile setting. And these clay-based tiles can be further customized through the use of tinted grout between tiles. But you’ll need to scrub that grout clean with an abrasive agent like baking soda, as well as regularly dry sweep and wet mop the tile to keep it clean. RELATED: Porcelain or Ceramic: Which Tile Type is Right for You? Otherwise, glazed ceramic tile offers strong moisture, chemical, and stain resistance over its 10- to 20-year lifespan, even when faced with standing water (a real possibility in combo laundry-and-mudrooms). Unglazed tile first needs to be sealed with a penetrating tile sealer to provide these protections. All ceramic tile is slipperier, colder, and noisier than other laundry room flooring options, so know that the whirring of the washer or dryer is more likely to reverberate on this type of flooring. Choosing certain heated and/or textured ceramic tile can create more warmth and traction underfoot. You can’t beat the durability of natural stone tiles made of slate, marble, travertine, limestone, or similar materials—not when they offer between 20 years to a lifetime of protection from moisture, stains, and dents! You’ll pay a high price for the luxurious looks and virtual indestructibility, anywhere from $5 to $10 per square foot, according to ImproveNet, but this cost can partially be offset by the higher resale value of homes with stone surfaces. Like ceramic tile, stone laundry room flooring will feel cold and slippery, but you can avert this by installing heated and textured stone. Keep in mind that the heavy weight and large size of the tiles—anywhere from 12×12 to 18×18 inches—coupled with the potential need for two layers of subflooring makes it difficult for most homeowners to install or replace themselves. The price of professional installation and any repairs should be factored into the estimated cost of this flooring. Laminate flooring, available for $1 to $5 per square foot, according to ImproveNet, consists of easy-to-install interlocking planks made of backer paper, a wood-based core, a printed paper layer, and a wear layer. The printed layer can be made to look like natural materials such as wood or stone, simple solids, or complex patterns. The wear layer effectively preserves the floor color when exposed to sunlight and protects the flooring from scratches, dents, and scuffs. But its core being a wood product, the flooring produces a hollow sound when walked over that can annoy the sound-sensitive. (You may be inclined to layer with rugs.) More importantly, laminate flooring can swell or warp with heavy water exposure, which makes it a less ideal option when your laundry appliances are located in a mudroom. This also means you also shouldn’t wet mop it—only vacuum, sweep, and wipe up spills as they occur, and dry mop it with a light spray of water. RELATED: Hardwood or Laminate: Which Is the Right Flooring for You? If you want your laminate floor to live up to its potential lifespan of 10 to 30 years, consider applying a bead of water-resistant PVA (polyvinyl acetate) glue to the tongue (i.e. flat edge) of planks before interlocking them; it will act as a barrier to moisture. Similarly, identify and repair laundry room leaks early, and avoid air-drying dripping garments in a laundry room where this type of flooring is installed. 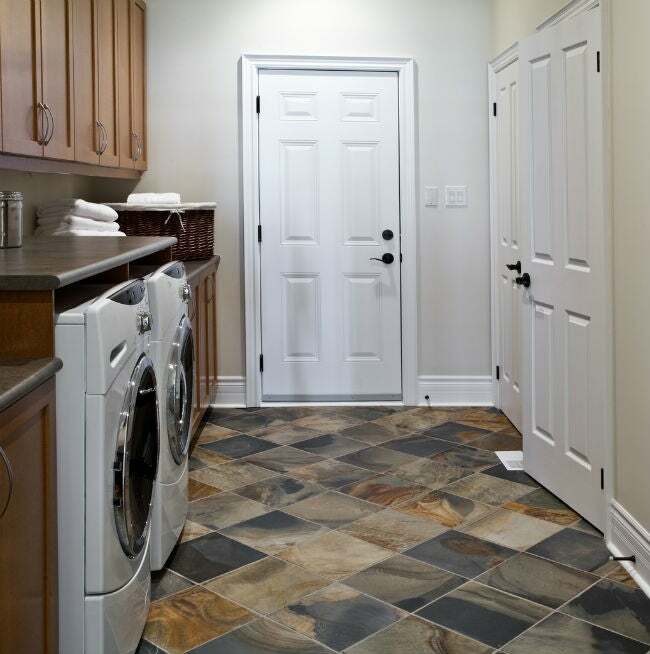 While LVT, sheet vinyl, ceramic tile, stone, and laminate all have the makings to be attractive and durable laundry room flooring, there are still some options that fall short. Beware of the pitfalls of the following three picks. 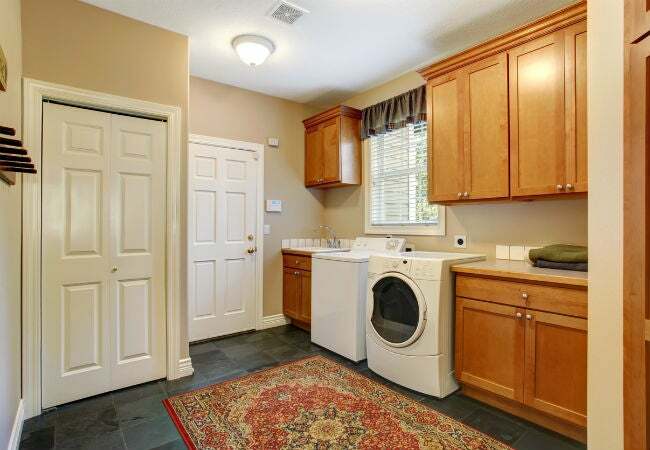 • Carpet, though relatively low in cost ($0.25 to $10 per square foot, according to ImproveNet) and warm and cushy underfoot, is the worst candidate for laundry rooms. 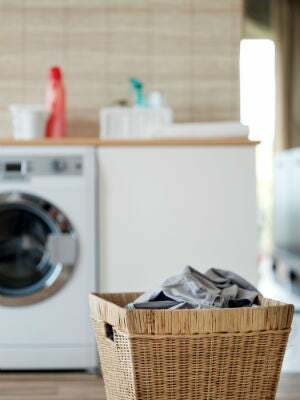 Its nap readily catches laundry lint and dust as well as absorbs water from appliance leaks, overflows, and detergent or other chemical splashes. The longer the pile, the slower the carpet takes to dry and the more likely it is that mold, stains, and musty smells will take root in your carpet. You may even find yourself forced to replace it before its 10-year lifespan is up. • Hardwood, available for $2 to $20 per square foot, according to ImproveNet, is certainly worthwhile in other interiors where it can be expected to last 20 years or longer. But its natural warmth, radiance, and durability are all diminished in the laundry room. Moisture can warp and/or rot it, while high foot traffic, replacement of appliances, and spills can lead to splinters, gouges, or stains. You can certainly patch gouges with wood filler and seal the hardwood to improve its moisture resistance, but these tasks have to be repeated on a regular basis, which may not be worthwhile in a non-public space like the laundry room. • Bamboo flooring, made from bamboo poles or stems, can be two to three times harder than certain hardwoods like pine and offer similar lifespan (20 years and up) for the lower price of $2 to $10 per square foot, according to ImproveNet. Still, the sustainable flooring material can be prone to scratches or dents from pets, foot traffic, or appliances; if your planks have been tinted brown through a carbonization process, they may have been made even softer and more vulnerable to such impacts. In addition, high humidity, spills, leaks, or minor flooding can cause the floor to swell, warp, or rot, while overly dry conditions can shrink and crack the floor.